Kantar Worldpanel’s fifth annual Brand Footprint report is published today, revealing the most purchased FMCG brands across the global markets. For Taiwan, I-Mei and Kuang Chuan continued to feature as the Top 2 brands, with I-Mei leading the ranking for the third year running, and is the only brand in Taiwan with over 80% household penetration. I-Mei and Kuang Chuan are also the only brands that were chosen over 50 million times for 2016. Globally, Coca Cola remain the world’s most chosen brand, and is the number 1 brand in 9 countries. I-Mei is able to secure its number 1 position due to their active expansion into new categories, focus on local ingredients and quality, and most importantly their relentless effort in promoting food safety which is a crucial factor solidifying consumer’s confidence for the brand. And as a result of these efforts, for 2016, I-Mei has seen its products picked an average of 8.1 times by 87% of Taiwanese households, totaling over 58.5 million times, gaining 270 thousand new household buyers and making it the most chosen brand for 2016. The number 3 position continued to be maintained by Standard Dairy, the brand’s focus on healthy, natural image and effort in expanding its consumer base saw its consumer reach points (CRP) grew by 10%, which is an additional 2.8 million purchases compared to the previous year. Three brands from the Uni-President brand family made it into the top 10, with Uni-President in 4th, Chui Sui in 6th and Ch’Un Chi Tea in 8th respectively. Ch’Un Chi Tea was able to make it back into the top 10 after successfully revamping itself into a young and vibrant brand again. 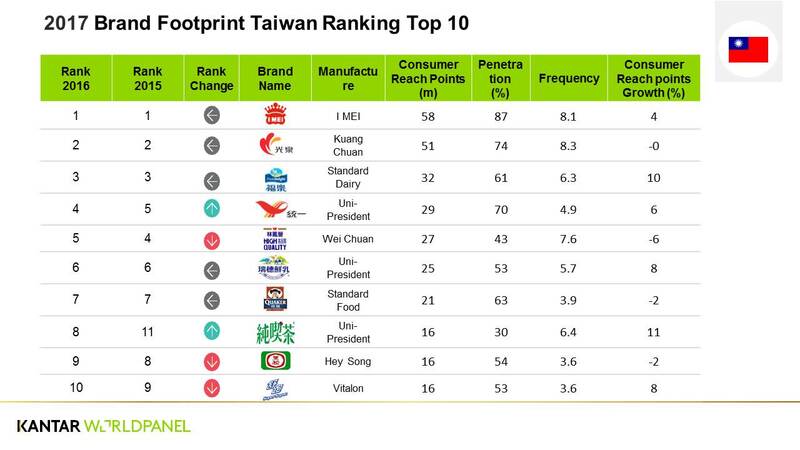 It is not hard to see consumer’s preference towards local goods, with Taiwanese brands fully occupying the top 10 seating, even in the ‘fastest growing brand ranking’ 7 out of 10 were local brands. Compared to international brands, local brands have a better understanding of consumers preference and taste, which also gives them the advantage to better adapt the brand to local needs, hence it is no surprise that Taiwanese brands were able to outperform their international competitors. 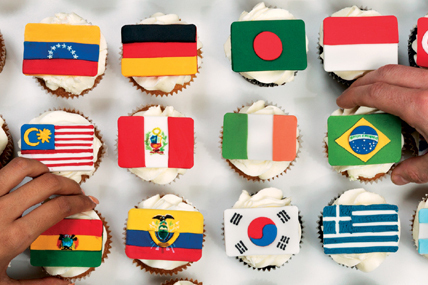 Kantar Worldpanel’s annual Brand Footprint study is based on research from 73 per cent of the global population; a total of one billion households in 43 countries across five continents—covering 75 per cent of the global GDP. As part of the study, Kantar Worldpanel tracks 200 FMCG categories around the world across Beverages, Food, Health and Beauty and Home Care. Brand Footprint is set apart from other brand rankings by providing information on real consumer behaviour rather than attitude. Consumer Reach Points (CRPs) form the basis of the ranking. An innovative metric that measures how many households around the world are buying a brand (penetration) and how often (frequency), it provides a true representation of shopper choice. By major categories, I-Mei and Kuang Chuan took 1st position in Food and Beverage respectively, while Personal Care’s Sofy and Home Care’s Kleenex secured number 1 for the 5th year running. Climbing 3 places in Home Care, local brand De yi were chosen an additional 800 thousand times, a growth of 13% in CRP. Knorr achieves the highest growth of CRP (+25%) amongst the top 50 brands. Knorr’s recipe, both innovative and convenient helped its product line win more household consumers. 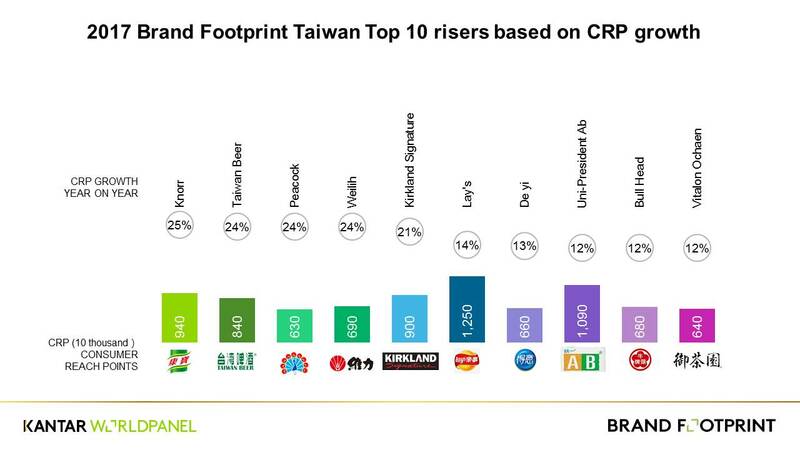 Other growing brands worth mentioning includes Taiwan Beer, Weilih, and Peacock, all achieving CRP growth of 24%. Taiwan Beer’s success came from planning their product strategy on current trend and innovative limited edition products; Weili and Peacock made it into the top 50 for the very first time. Costco’s Kirkland Signature is the fastest growing private brand, appearing in the fastest growth ranking for 2 consecutive years. Its successful channel strategy and membership system helped its expansion into various categories, helping growth in both consumers base and shopping frequency. Yvonne Wang, General Manager of Kantar Worldpanel Taiwan, says: “Despite slow down in Taiwan’s FMCG market for the past two years, brands that are able to accurately reflect consumers needs and desire, which is convenience, healthy, safe and heart warming, are still able to maintain a healthy growth. From the performance of the fastest growing brands, fast moving consumer goods is only moving faster, with notable differences in the result every year, which means brands will need to maintain continual grasp on the latest consumers trend should they wish to remain competitive in the market. - Coca Cola remained global number 1 for the 5th year running, and is also the number 1 brand in 9 countries. - Global number 2 Colgate continued to expand its consumers base, and is the only global brand with over 50% penetration. - Dettol has entered the Top 50 ranking, and is the fastest growing brand (CRP +12.5%), gaining 12.4 million new buyers. - Dove gained the most buyers with a additional of 14 million new household buyers. - Total FMCG brand sales grew by 3% in value, slowing down from 4% last year. Other than Latin America’s 9% growth, all other states is seeing slow down in growth. Asia slowed down from 6% in 2015 to 2% this year. - 72%。Local brands grew by 3.9%, higher than Global brands’ 2.6%, and contributing 72% of the global FMCG market growth. - Price gap between local and international brands in shrinking, international brands no longer has the high price advantage. - Local brands are relatively strong in the Asia market, accounting for majority of the shopping trips, with Korea leading at 78%, followed by Rural Vietnam (78%), Russia (78%), and Taiwan (70%). - Yily takes down China’s Number 1 for the second year, followed by Mengniu, reaching 1 billion in CRP for the past year. - Kirkland Signature gained an additional 9 million in CRP, making it number 1 choice in retailer private brand.